The Praesidium estate is located in the western hills of the Peligna Valley, in the town of Prezza, the inner area of the Abruzzo region. This area, surrounded from the Morrone and Maiella mountain chains and not far from the Gran Sasso d’Italia, was known in the past as “Abruzzo Ulteriore Secondo”. 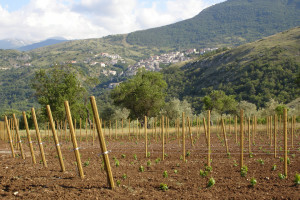 The 5 hectares of the Praesidium vineyards, exposed to sun light for the duration of the day, lays on the hills facing south-east at about 400 metres above sea level. The microclimate of the area, influenced by the presence of mountains and by its distance from the coast, is excellent because of low humidity, steady winds and a great variance in the temperature between day and night. 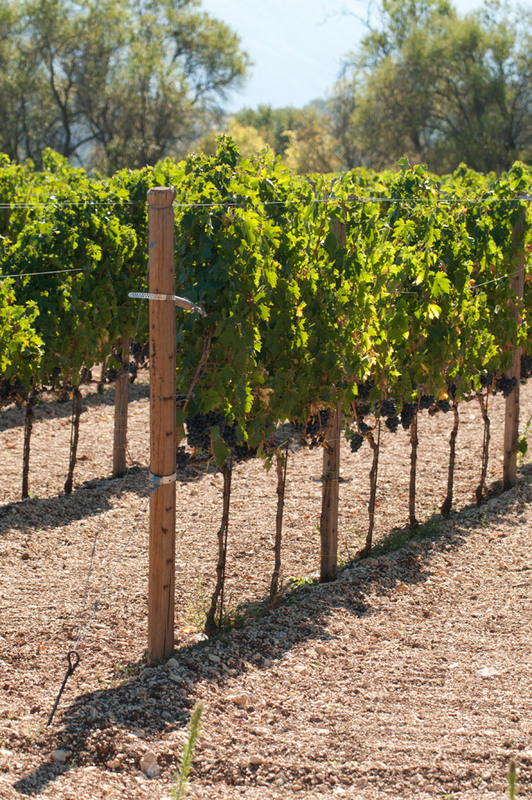 These conditions allow for a gradual ripening of grapes.The cool temperature at night helps the berries fixate their flavors until they reach a perfect ripening, which usually occurs during the first half of October. 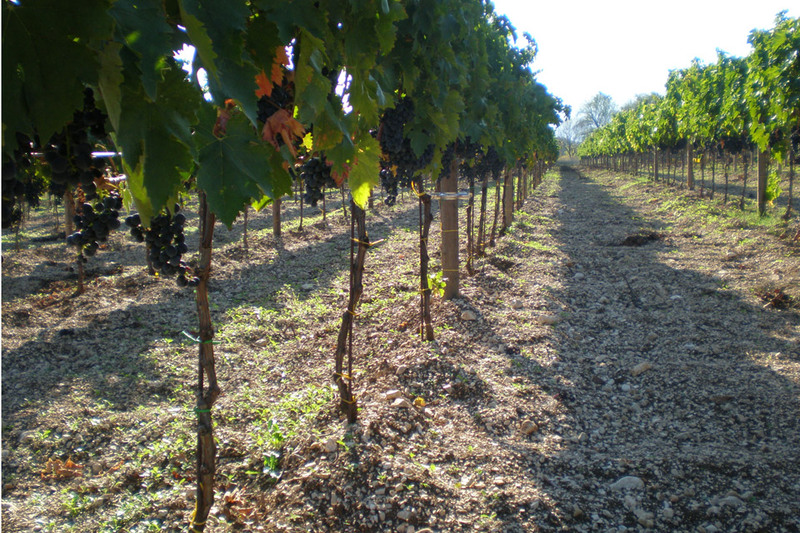 The soil, of alluvial origin, is ideal for growing the Montepulciano vines. It’s clayish, calcareous and particularly rich with white calcareous stones, that helps the water drain. The substrate of the soil is mainly rocky. Since 1700 the mountainous and submontane area surrounding the Peligna Valley has been rewarded as the birthplace of the vine Montepulcianod’Abruzzo, known in the past as Montepulciano cordisco o tardivo. The history of the Montepulcianod’Abruzzo began in these inner and montaneous areas of the region. As widely written by Franco Cercone in his “La meravigliosa storia del Montepulciano d’Abruzzo” (Ed. Amaltea, 2000), this vine, throughout 1825-1830, was revealed by the researcher Moretti as the true Montepulciano, or, in Moretti’s exact words, as “l’attuale e vero Montepulciano.” In addition, it is worth it to mention; two more important essays, one written by Baron Durini,“De Vini degli Abruzzi”, that can be found in the “Annali Civili del Regno delle Due Sicilie”(N.36, 1820) and the other, written by Michele Torcia, archivist and librarian of king Ferdinand IV, named: “Saggio Itinerario Nazionale del Paese dei Peligni” (Napoli, 1793). Baron Durini and Michele Torcia were fellow travellers. Their essays are some of the first witness of the presence of the Montepulciano d’Abruzzo in the Peligna Valley. Durini praises the excellent microclimate of the Peligna Valley for the benefit of many vines, in particular the Montepulciano. Specifically, the towns Prezza and Bugnara, located in the “Valle di Solmona,” are mentioned as containing the ideal conditions. These conditions include vines that are low and close to the soil with grapes that ripen perfectly with the help of direct sunlight and sunlight reflected from the white stones that permeate the soil.